Preface. 1. Introduction (L.P. Gor'kov and G. Grüner). 2. Structural, electronic properties and design of quasi-one-dimensional inorganic conductors (J. Rouxel and C. Schlenker). 3. The CDW transition, structural studies (J.P. Pouget and R. Comes). 4. Dynamical properties of charge density waves (G. Grüner and P. Monceau). 5. Deformation and phase-slip in charge density waves in quasi-one-dimensional conductors (F.Ya Nad'). 6. Charge density wave current oscillations and interference effects (S.E. Brown and A. Zettl). 7. Theory of CDW pinning by weak impurities (M.V. Feigel'man and V.M. Vinekur). 8. Computer simulations of CDW dynamics (P.B. Littlewood). 9. Transport phenomena in CDW conductors, microscopic approach (S.N. Artemanho and A.F. Volkov). 10. Phase slipping processes and the generation of narrow-band oscillations by charge density waves (L.P. Gor'kov). 11. Solitons in crystals of charge density waves (S. Brazonskii). Author index. Subject index. Cumulative index. 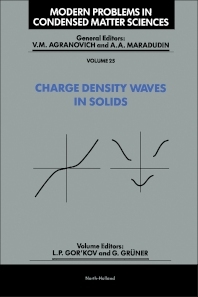 The latest addition to this series covers a field which is commonly referred to as charge density wave dynamics. The most thoroughly investigated materials are inorganic linear chain compounds with highly anisotropic electronic properties. The volume opens with an examination of their structural properties and the essential features which allow charge density waves to develop. The behaviour of the charge density waves, where interesting phenomena are observed, is treated both from a theoretical and an experimental standpoint. The role of impurities in statics and dynamics is considered and an examination of the possible role of solitons in incommensurate charge density wave systems is given. A number of ways to describe charge density waves theoretically, using computer simulations as well as microscopical models, are presented by a truely international board of authors.